Crown Princess Mette-Marit of Norway (born Mette-Marit Tjessem Høiby on 19 August 1973 in Kristiansand, Norway), is the wife of Crown Prince Haakon, heir apparent to the throne of Norway. A Norwegian commoner and a single mother with a disadvantageous past, she was a controversial figure at the time of her engagement to Haakon in 2000. She became crown princess of Norway upon her marriage in 2001. In this role, she has championed humanitarian projects and arts, as well as taking part in official visits at home and abroad. By her own admission, Mette-Marit experienced a rebellious phase before she met Crown Prince Haakon Magnus. As a part-time student, she took longer than usual to complete her high school education before going on to take preparatory university courses at Agder. She then worked for a year at Cafe Engebret in Oslo. In the late 1990s, Mette-Marit attended the Quart Festival, Norway's largest rock festival, in her hometown of Kristiansand. She met Crown Prince Haakon at a garden party during the Quart Festival season. Since becoming Crown Princess Mette-Marit has taken several university level courses. In 2012, she obtained a master's degree in Executive Management. In an analysis of Mette-Marit's ancestry, it was revealed that several of her ancestors (as well as some living relations) were farmers and she is distantly related (prior to the 15th century) to some Norwegian and Swedish nobility. Her first official appearance as the intended bride of the Crown Prince was at the Nobel Peace Prize ceremony at Oslo City Hall on 10 December 2000, following the announcement of the couple's engagement on 1 December. At the press conference, Haakon said that he and Mette-Marit had been together for about one year. Haakon gave Mette-Marit the same engagement ring as his grandfather King Olav V and his father King Harald V gave to their fiancées. The couple married on 25 August 2001 at the Oslo Cathedral. 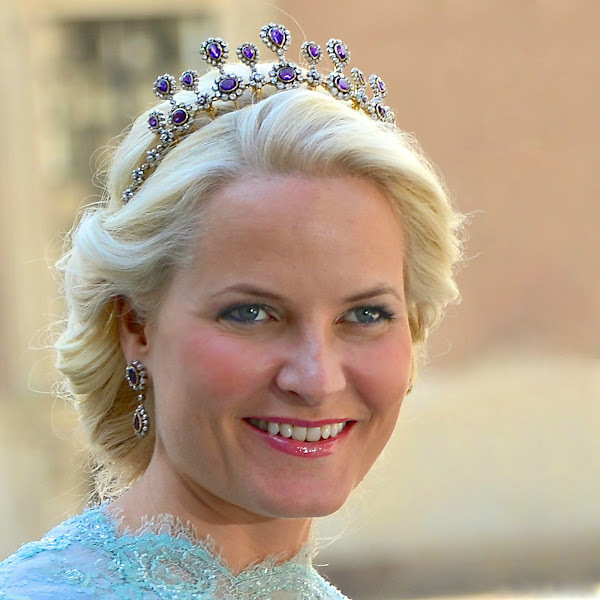 Upon her marriage she acquired the title Her Royal Highness Crown Princess Mette-Marit of Norway. They now live at Skaugum estate, outside Oslo. The couple has two children together: Her Royal Highness Princess Ingrid Alexandra, born 21 January 2004. His Highness Prince Sverre Magnus, born 3 December 2005. Mette-Marit is a crown princess.